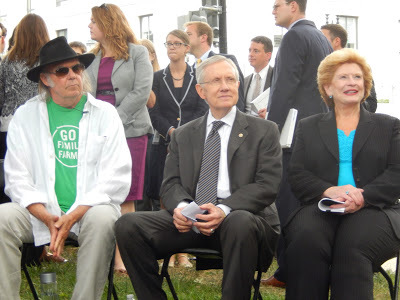 Neil Young, Senator Harry Reid and Senator Debbie Stabenow at a press conference today on Capitol Hill in Washington, DC last week. Last week it was Neil Young taking a stand against the proposed Keystone Pipeline, which if build would transport tar sands oil from Hardisty, Alberta, through Montana and South Dakota to Steele City, Nebraska, according to Wikipedia. President Barack Obama has been delaying his decision regarding the pipeline. “The Keystone XL and tar sands expansion have no place in a clean energy future,” Redford said in the video. “I can understand why oil companies love tar sands. There is a lot of money to be made by strip mining and drilling the dirtiest oil on the planet. Up in Canada this is how the story is being covered — be sure to check out the video embedded in the story.